The Art Deco Skyscraper building under construction in 1930. Mundelein College was founded in the same year that the stock market crashed. 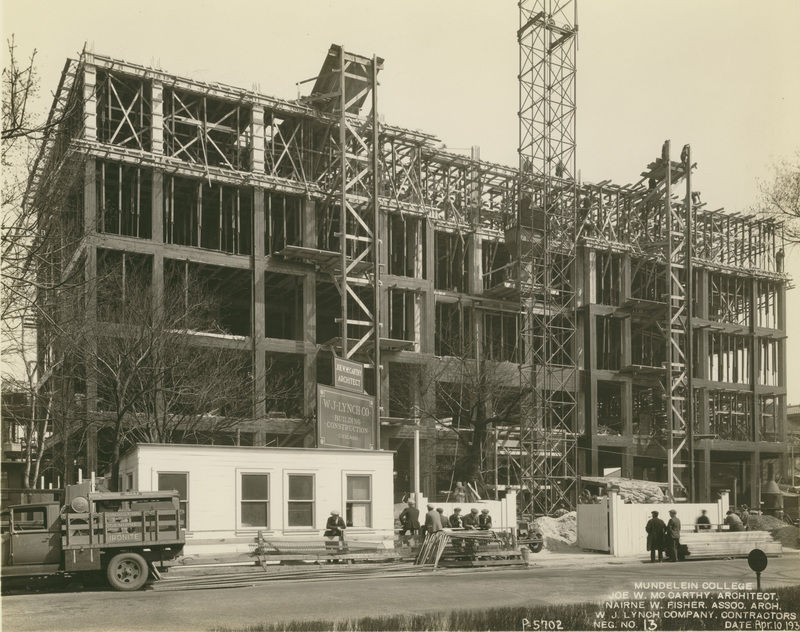 In 1929, while the American economy was crumbling, Mundelein College and its unique home, the Mundelein skyscraper, was rising. It took an indomitable person to see that it was done, and the college’s co-founder, Sister Justicia Coffey, BVM, was just such an individual. Sister Justicia had a vision which included a superior Catholic education for young modern urban women. The skyscraper was the setting for that vision, but Sister Justicia knew that an excellent education required exceptional teachers. Sister Justicia approached the construction of both the building and the faculty with equal vigor and procured whatever either task demanded. While blueprints and the careful inspection of steel beams were imperative for the building, the teachers required a rapid accumulation of graduate degrees and for the elevation of their spirits, Prince, a tri-color collie. This summer, my colleague, Nathan Ellstrand and I have been building “Voices from Mundelein,” a web media portal which highlights the staff, alumnae, and faculty of Mundelein College. It includes oral histories which feature the earliest years of Mundelein College. In her rich oral history, long-time Mundelein faculty member, Sister Irma Corcoran reflects fondly on memories as wide ranging as Sister Justicia Coffey’s unique style of leadership and the college’s pet collie, Prince. In her 1997 audio interview, Sister Irma Corcoran, BVM, claims that she was a member of the college community for the entirety of Mundelein’s sixty-one year existence. Sister Irma arrived as a faculty candidate in 1929 when the skyscraper was dedicated and left in 1991 when Mundelein affiliated with Loyola University Chicago. She recalls that Sister Justicia created a significant portion of her coterie of faculty members by gathering young novitiates of the Sisters of Charity of the Blessed Virgin Mary (BVM) who had completed college degrees, a rare commodity indeed. She then sent them to distinguished universities to complete their graduate studies with an injunction to return to Mundelein and disseminate their new-found knowledge. Sister Irma was one of those novitiates. She was sent to Columbia University to study English, one of the few women, and the only sister in the student body. Ultimately Sister Irma returned, taught, and became a renowned Milton scholar. When Sister Irma first arrived, the skyscraper was not yet completed and she and her fellow graduate school headed novitiates were quartered in what she calls “the little green house” next door. As did all of the founding faculty members, Sister Irma wore many hats and in addition to teaching, she served as a general porteress for the college. She brokered purchases from coal to eggs and dealt with contractors, visiting clergy, and what she calls insistent BELLS. She especially remembers her fellow porter of the canine variety, Prince. Sister Irma reports that the black and white collie pup had a bark that “would intimidate an army.” Prince took his responsibilities seriously, and guarded the little green house assiduously. One time, Sister Irma recalls, he barked “terribly” and she went to the front door and found the postman pinned to the porch railing with his heels in the air. 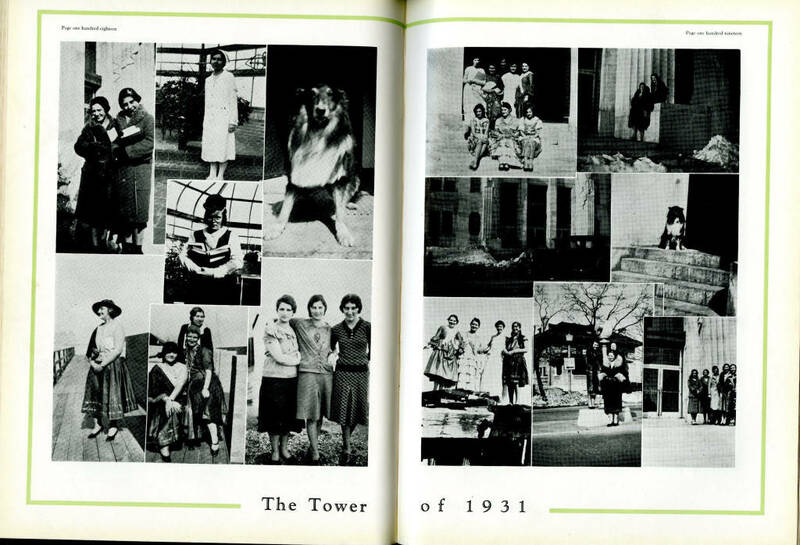 Photos of Prince are featured prominently in the Mundelein College Yearbook of 1931. Guarding the porch was not Prince’s only function, it can be inferred from Sister Irma’s interview that he walked the sisters each day after breakfast, in the company of Sister Justicia Coffey. Sister Justicia made it a point to get acquainted with each new novitiate and the latest to arrive was always the chosen companion for the daily morning walk. They would walk the city streets from Kenmore to Rosemont to Sheridan, and finish by looking over the lake and then turn toward the skyscraper which Sister Justicia inspected with a gimlet eye assessing the days’ construction. Often, Sister Irma recalls, Justicia would chat with the workers, whom she knew by name, inquiring about orders and making suggestions. Sister Irma’s memories conjure up the image of two habited sisters, one middle aged the other, young, pausing on a Chicago street corner, engaged in deep conversation, perhaps about construction, teaching, or the persistent BELL with Prince tugging at his lead, distracted by the prospect of the postman’s anticipated daily arrival. Sister Irma reveals that Justicia understood the importance of foundations whether they were made of steel or of individual characters. She knew that both required a detailed understanding that springs from the constancy of daily rituals like a brisk morning walk with Prince. 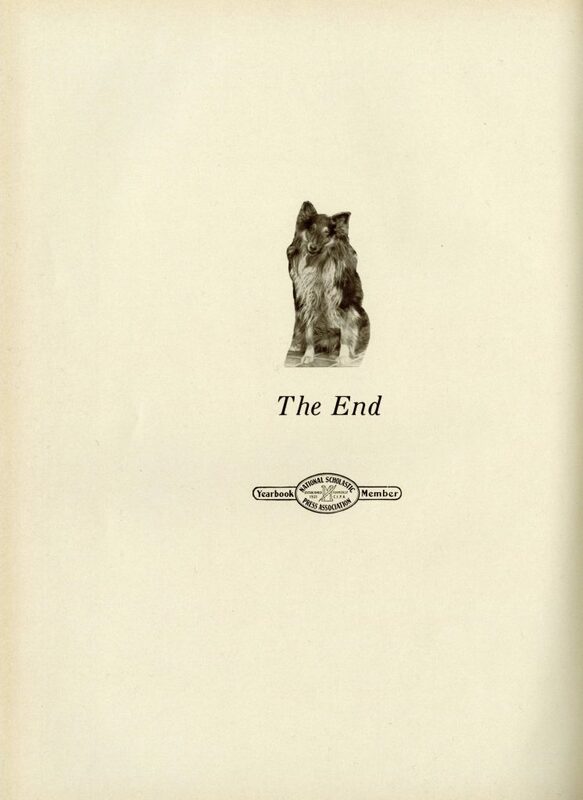 An image of Prince guards the final page of the Mundelein College Yearbook of 1932. More information about Sister Justicia Coffey and Mundelein College is available online through the Loyola University Libraries Digital Special Collections or in person through a visit to the Loyola University Chicago Women and Leadership Archives. 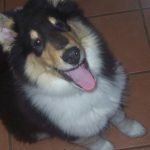 Bruce, pictured here, is the current canine porter and guardian of the door for the author of this blog, Janette Clay. Besides being an inveterate daily walker, Janette is a PhD student in the department of history at Loyola University Chicago and member of the summer staff at the WLA. This entry was posted in Mundelein College, Uncategorized and tagged Chicago History, dogs, Education, women religious, Women's Colleges by Women and Leadership Archives. Bookmark the permalink.